Our 12 Days Rwanda wildlife safari fully enables you discover the land of a thousand hills as we encounter Rwanda’s wildlife starting from the tour around Kigali City “Africa’s cleanest city” before starting to visit Rwanda’s National Parks with a visit to Akagera National Park one of Africa’s oldest parks to be gazetted. The 12 Days Rwanda wildlife safari will then be made amazing when we travel to Volcanoes National Park for Africa’s most amazing encounter the “gorilla trekking experience” then track golden monkeys before proceeding with our 12 Days Rwanda wildlife safari drive to Lake Kivu for amazing beach life and boat cruise water sport as we get ready for our final trekking experience of chimpanzees and colobus monkeys from Nyungwe Forest National Park as we put an end to our 12 Days Rwanda wildlife safari that fully lets you discover Rwanda’s culture and nature. Arrival at Kigali International Airport meet and greet with your driver/guide then transfer to the hotel booked for accommodation for check in as you set yourself for an amazing 12 Days Rwanda wildlife safari that starts with a full Day Kigali city tour “Africa’s Cleanest City” Meal plan: Bed and Breakfast. Rwanda’s attractive Kigali city said to be Africa’s cleanest city built over a series of several hills with an impressive array of hotels, restaurants and bars some of which are of international repute to choose from, here we wake up in the morning take breakfast then start our city tour with a visit to Kigali genocide memorial in Gisozi a permanent exhibition documenting what transpired during the 1994 Rwanda genocide, visit Mille Collins from the famous Hollywood movie “Hotel Rwanda”, Craft market and the busy local city market of Kimironko. Meal plan: Bed and Breakfast. Akagera National Park is Rwanda largest Game Park covering an area of over 1,085km, it lies along the Rwanda and Tanzania border with the Akagera River running through it. The park was named after the Akagera River back in 1934 hence making it one of Africa’s oldest National Parks gazetted by then the Belgium colonial administrators to protect animals and the three habitats savannah, mountain and swamps. 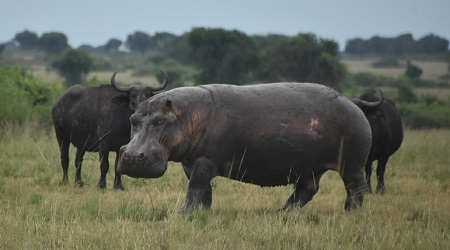 Our 12 Days Rwanda wildlife safari drive to Akagera National Park lets us encounter big 5 games, large herds of Buffaloes, Elephants, Zebras, Giraffes and a variety of Antelopes, due to Akagera National Parks high concentration of many Lakes, you stand high chances of viewing schools of hippos and Nile crocodiles. 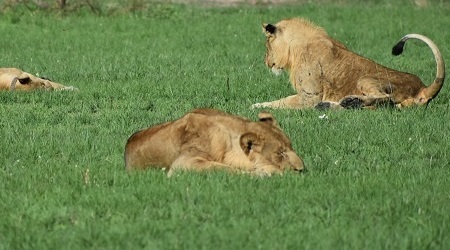 Akagera National Park also has a small but significant number of predators such as Leopards and spotted hyenas, there is also an ongoing reintroduction of Lions, there also white rhinos, mongoose genet and serval cats, side stripped jackals. The primates in the park include olive baboons, vervet monkeys, bush babies and the rare silver monkey. Having checked in at the booked lodge, we head for the afternoon boat cruise on Lake Ihema the largest lake among the many found in the park, while on the cruise you get to see numerous hippos and the Nile crocodiles as mentioned above plus a vibrant bird life. Fishing and birding are other activities that can be done in Akagera National Park. Meal plan: Breakfast/Lunch/Dinner and Accommodation options: Ruzizi Tented Lodge (Mid-Range Option), Akagera Game Lodge (Luxury Option). The 12 Days Rwanda wildlife safari starts with an early morning game drive in the Akagera National park, here we take you around the numerous lakes where you have a chance to encounter Hippos and Nile Crocodiles, Big games like Buffalos, Elephants, Zebras, Giraffes and a variety of Antelopes, primates like olive baboons, vervet monkeys and on a lucky morning the white rhino, Lions and Leopard. Meal plan: Breakfast/Lunch /Dinner and Accommodation options: Ruzizi Tented Lodge (Mid-range option), Akagera Game Lodge (Luxury option). Our 12 Days Rwanda wildlife safari starts with a drive to Volcanoes National Park that lies in the north of the country along borders of Uganda and Democratic Republic of Congo. This park is approximately 100km from Kigali City and therefore just 3 hours’ drive from Kigali International Airport, with an estimated 900 gorillas roaming in the Virunga massif of Uganda, DR.Congo and Rwanda, in the mountains of Muhavura, Mgahinga and Sabinyo. The park is also home to over 100 bird species and amazing ecosystem. Apart from the gorilla safaris, one can also experience golden monkey tracking safaris, hiking volcanoes, a visit to the Karisoke research center and Diana Fossey grave and the community tour. We shall have a lunch stop in Kigali city then visit the Diana Fossey exhibition at the Diana Fossey International fund in Musanza. Meal plan: Breakfast/Lunch/Dinner and Accommodation options: Da vinici (Budget option), Mountain View Gorilla Lodge (Mid-range option) and Wilderness Safaris Bisate Lodge (Luxury option). Rwanda wildlife safari gorilla trekking experience will commence with an early breakfast at 6am, having equipped ourselves with water not less than 2 liters, packed lunch, rain gear, sun lotion, bud spray, gloves, hiking boots, long pants and long sleeved shirts, we drive to the briefing center at Kinigi park headquarters for a gorilla trekking briefing on do’s and don’ts while in the gorilla jungle and distribution to respective gorilla families, volcanoes National Park has 10 gorilla family groups habituated for tracking. We set off for the gorilla trekking experience, this would be either short or long between 4-6 hours, with the 1 hour spent with the gorillas being the most rewarding experience of the whole hike. In the afternoon we plan to visit the community at the gorilla guardians which is a community project promoting and exhibiting the Kinyarwanda culture show casing different aspect of dance marriage, tradition medicine, food and much more. Important to note: The center helps to reintegrate former poacher and give them an alternative means of survival. Meal plan: Breakfast/Lunch/Dinner and Accommodation options: Da vinici (Budget Option), Mountain View Gorilla Lodge (Mid-range option) and Wilderness Safaris Bisate Lodge (Luxury option). Volcanoes National Park is one place where Gold meets Silver just like Uganda’s Mgahinga Gorilla National Park here gorillas and golden monkeys share the same jungle hence offering you a chance to trail these pretty primates that can only be spotted from these two areas across Africa. Golden monkeys are found usually in the bamboo zone of the high altitude mountain forest, These primates are known as golden monkeys due to their golden color fur that is very pronounced when the sun reflects on them the walk will take about 3-4 hours and spend an hour with them, Having encountered the amazing golden monkeys, the afternoon is set for a relaxation back at the Lodge. Meal plan: Breakfast/Lunch/Dinner, Accommodation options: Da vinici (Budget option), Mountain View Gorilla Lodge (Mid-range option) and Wilderness Safaris Bisate Lodge (Luxury option). Day 8: Drive to Lake Kivu in Rubavu town and afternoon boat cruise. Day 9: Relax day at Lake Kivu to choose any optional activities on the lake. Intact mid elevation found between 1600 and 2000 meters above sea level the Nyungwe forest is among the most rare and only remaining forest types on the African continent covering an area size of over 1000 km sq, it’s one of Africa’s largest protected mountain rain forest and a source to Africa great rivers that is the Nile and Congo rivers. The Cyamudongo forest fragment is the popular chimpanzee trekking sector of the forest with a highly habituated community, covering an area of 4kmsq close to 1½ hours’ drive from Gisakura. Nyungwe forest has an estimated population of over 500 chimpanzees whereas the Cyamudongo area has an estimate of over 25 chimpanzees, apart from the chimpanzees the forest is also home to other 12 primate species such as the Blue monkeys, Vervet monkey, Grey cheeked Mangabey, Dent’s monkey, L’hoest’s monkey, Angola colobus, Red tailed monkey and the owl faced monkey. The previous day check in at Nyungwe forest National Park Gisakura reception center, your guide will be made aware of the point of rendezvous and time however you should know that if you’re tracking in Cyamudongo forest it is an early start whereas the ones at Uwinka, starting time varies, before embarking on the activity there will be a briefing about chimpanzee tracking do’s and don’ts while in the chimp jungle, later return to the lodge get ready for the afternoon hike to see the rare Angolan species of colobus monkeys. Meal plan: Breakfast/ Lunch /Dinner and Accommodation options: Gisakura Guest House (Budget option), Nyungwe Top View Hill Hotel (Mid-range option), One and Only Nyungwe House (Luxury option). The end of your 12 Days Rwanda wildlife safari, depending on the flight time, we can visit the craft shops for souvenir shopping then we transfer you either to Kigali International Airport or hotel. Meal plan: Breakfast/Lunch. Tracking permit per person for each primate as indicated in the itinerary. Tips and all personal expenses.